Even as California Chrome‘s bid for horse racing’s first Triple Crown in 36 years came to a thudding halt in yesterday’s 146th Belmont Stakes, the outdoor track season swept into full summer swing last Thursday from sea to shining sea with plenty of action on the enameled plain in between. In San Diego, Eric Avila and A.J. Acosta, two former area high school stars who have been beset by bad fortune in recent years, returned to top form to cap off the Jim Ryun Festival of Miles at the San Diego High School track. 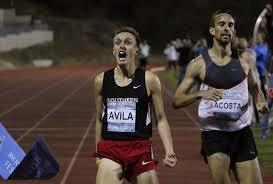 Avila blasted a near 10-second PR 3:56.89 to edge out Acosta’s 3:57.07 in front of a small but enthusiastic gathering that came to celebrate the 50th anniversary of Jim Ryun’s first high school sub-4 minute mile, a crowd that included many of track’s former stars from SoCal. Eric Finan edges out New Zealand’s Hamish Carson (blue), Providence College’s Julian Oakley and Leo Manzano in Concord, Mass. Back east In Concord, Massachusetts Eric Finan of Team USA Minnesota joined Avila in the sub-4 club, his 3:58.73 leading three other men sub-4 at the 6th Adrian Martinez Classic. 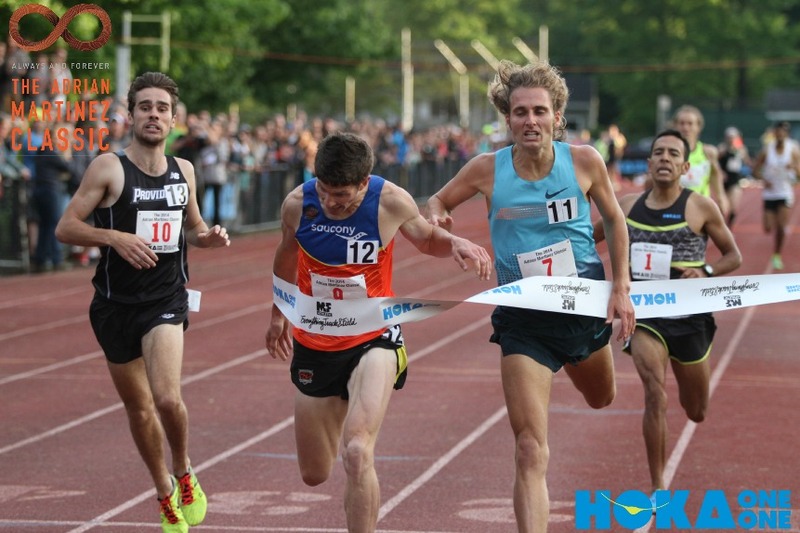 New sponsor Hoka One One brought in Olympic 1500m silver medalist Leo Manzano as the star attraction, but Leo could only manage fourth place (3:59.31) in the tightly contested race. 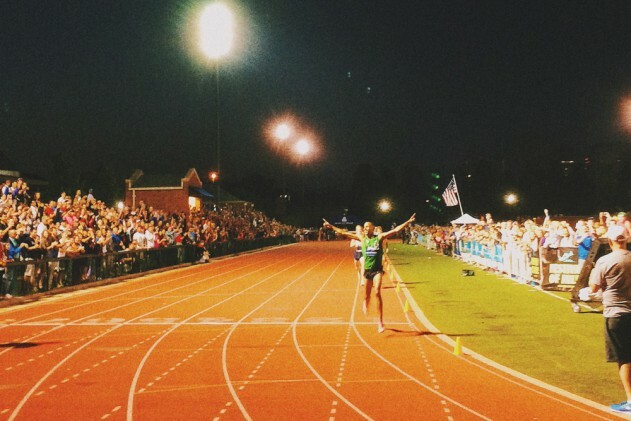 And in St. Louis, Missouri Jordan McNamara of Nike OTC Elite posted a 3:54.27 clocking to take down Leo Manzano’s 2009 event record (3:55.29) in the seventh edition of the Nike Festival of Miles. It was JMac’s second win on the St. Louis University High School track. He captured his first FOM title in 2011. In all there were 10 men under 4:00 on the same night, two in San Diego, four each in Concord and St. Louis. And while all three events showcased excellent competition, giving fans much to appreciate and applaud, what also stands out is the parochial nature of it all. Even the name Festival of Miles shows how blinkered and uncoordinated the sport continues to be. 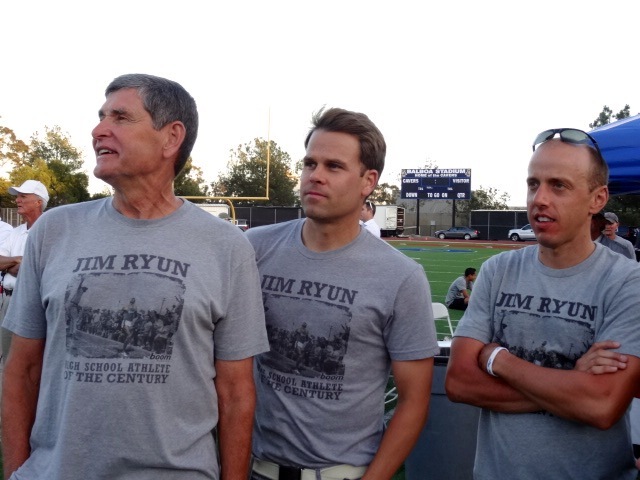 “What track needs is to coordinate these events,” said American record holder in the mile Alan Webb as he watched the Jim Ryun FOM at what was once Balboa Stadium where Jim Ryun won the AAU National title in a then-American record 3:55.3 in 1965 against Olympic 1500m gold medalist Peter Snell. This separate-but-equal staging is another aspect of what continues to haunt a sport where everything is locally branded. For a sport that once put athletes on the cover of Sports Illustrated – Jim Ryun himself notched eight covers – to have devolved into a series of small parochial meetings devoid of national attention is both sad and baffling. But running isn’t the only sport suffering from this problem. This is the age old argument one hears when discussing people’s feelings about the U.S. Congress. Yes, they are disgusted by Congress in general, but my congress person? “Oh, he/she’s okay”. Thus, incumbents continue to get reelected at a 90% plus rate, and nothing changes. While the Jim Ryun FOM was staged as a one-time commemorative event, there are some who would like to see it become an annual celebration. Might there be a chance for the three meet directors in Boston, St. Louis and San Diego to discuss coordinating their presentations to create a mile Triple Crown? It sort of works for horse racing, another once prominent, but now beleaguered sport. Perhaps Ryan Lamppa, godfather for the Bring Back the Mile campaign, could serve as go between. Good points Toni. There should be more than just the Wannamaker mile indoors, or the Dream Mile outdoors (is that even still on?). Side topic, regarding fresh horses – in track, my money is on the one recently racing well, which is why horse racing is so different … 3 races in 5 weeks tires them out?! Didn’t Matt Centrowitz & Mark Belger have a race around Belmont Park once? Coordinated goals could do wonders, in many arenas. Hey Toni! I thought I would update you on the results of the June 8, 2014 37th. running of the Columbus (Ohio) 10K. I found it pretty interesting that Philip Lagat (who we saw & called as winner of this year’s Cleveland Marathon!) came in 2nd, and Julius Koskei (who I believe raced Cleveland too this year?) was the overall winner in 29:25. The Columbus 10K is the oldest road race in Columbus, Ohio! I truly enjoy your blog, and look forward to co-announcing with you again soon! Thanks, Karl. Pretty easy win for Julius by the looks of it. Appreciate the update. You make an excellent point, Toni. I do have to thank you for mentioning that the Nike Festival of Miles in STL has been around for 5+ years now…. while the race in San Diego is brand new and may be a 1-time deal or maybe not? I agree that their name choice showed complete disregard (or ignorance) for the STL event that is much older. How colloquial! But, that same casual disregard happens right here in the STL market as new “mom & pop” or other modestly sponsored road races pop up often now on the same weekend as established races….with complete disregard for anybody else. There are now so many races on each weekend during prime time season… that even the modestly successful races might be losing attendance/participation somewhat. They are cannibalizing each other. What we need here locally (and maybe nationally) is some sort of “clearinghouse or oversight organization” that helps keep the schedule sane and respectful of the ones who have worked and invested for several years…and keeps short term “ambushes” from happening. Is that something for USATF to do that is really needed? Or, do we need a completely different NGB for road racing….that tries to rein in problems like this and protect the long term future of our sport? I guess the same could be done in track…. but we have problems with T & F Meets disappearing… not popping up!…. so a crowded schedule for them maybe is not topical right now. Are we at the point where “licenses” need to be issued for road races….and isn’t that what a “sanction” from USATF is supposed to do? Rather than just access to event insurance…and a small mention on their website schedule? Does anybody ever really look at that? Maybe Men’s LDR committee and home office at USATF need to discuss this? The problem is that there is no cohesive oversight right now… just anarchy…. every race/meet is an island! Could be legally thorny…..BTW, I was at the STL Nike Festival of Miles… and it was entertaining for the good audience that showed up. Entire meet was under two hours….with just specialized program. And, it was at night and under the lights….which is when all track meets need to be held! Craig, you’ve seen it all before. It’s the Wild West out there, and the marshal is nowhere to be found, much less the city officials. In its own way its the American bottom-up ideal, but it’s too fragmented and indeterminate. All the synergy of a combined effort is lost when every event is a universe of one. Over the last 15 years the sport’s focus has turned very successfully to the participation side. But in turn the sporting element, the race, has just limped along, becoming predictable and oriented more toward records than personalities. What made Meb’s win in Boston so meaningful was the unpredictability of it. 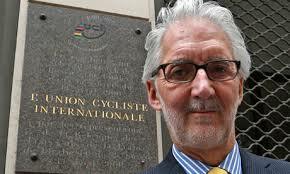 Perhaps that lesson will be taught, and we will see renewed interest in the structure of racing. My city, my team is the way of professional sport. When the shoe companies began cherry picking top athletes in the 1970s from GBTC, Colo TC, Atlanta TC, etc. we witnessed the erosion of the club-based system through which running had come to its apex in terms of popularity as a sport. Since then every athlete has become an independent contractor repping a shoe company, which the public has not rooting interest in. As I have said many times Yao Ming was not a 7’7″ Chinese basketball player, he was a 7’7″ Houston Rocket basketball player who hailed from China. We need to resurrect the old club system so that competitions would pit city-based teams against one another on a fixed schedule of meets with the shoe companies still supporting the top athletes. It’s how pro basketball works. I look forward to your column. A great story with great thoughts, Toni.